It’s the December sketch challenge over at Die Cuttin’ Divas, and guess what? You can use any of our sketches from 2017. Here they all are: I used two of them to create birthday cards for my neighbor’s parents, both of whom had birthdays last month. For her mom, I chose the March sketch. I even gussied up the inside a little. Here’s a secret – It’s a cheat! After spending all that time making my card, I didn’t want to chance messing up on the inside stamp so I stamped it on a separate scrap of paper, matted it and adhered it to the inside. Looks purposeful, right? 😉 Here are the details: The patterned paper is from the Citrus Mat Stack by DCWV; the Happy Birthday die is from Spellbinders, the Sentiments One pack cut with my Cuttlebug (A, B, and C plates with some scrap paper stuck in between as shims); Happy Chick Birthday stamp set from Unity; 5/8″ flag punch from Stampin’ Up. Next up is the card I made for her dad. It’s the July sketch but portrait instead of landscape. The mat under the pretty map paper is from the Elegant Edges Cricut cartridge; the sentiment is from the Jaded Blossom So Many Birthdays stamp set; the gorgeous paper (you know brown is my favorite color!! 🙂 ) is from the 7 Gypsies Travel 6×6 paper pack. My last card uses our June sketch and a Santa Claus for my 25 Days! All the papers are scraps and the Santa Claus and yellow pattern behind him are clip art. I used the Fill feature on an oval I created in the Silhouette software, put the Santa in front of it and print/cut. I made an offset oval out of red and used a CTMH stamp pad to ink the edges. I adhered it to the lower right hand corner of the card then trimmed the parts that hung over. I wonder which sketch you will use. 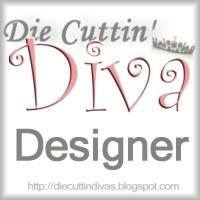 Stop by Die Cuttin’ Divas to see which the other designers chose. Every one of them is a winner in my book! Click the button if you want to link to my 25 Days of Christmas Crafting. This entry was posted in Paper Crafting and tagged 25 Days of Christmas Crafting, birthday card, birthdays, Die Cuttin' Divas Design Team, Elegant Edges, masculine. Bookmark the permalink.